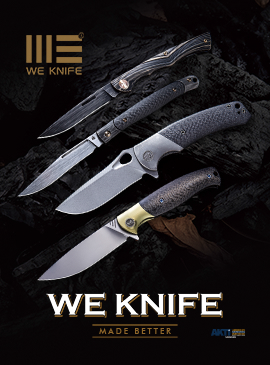 The Obake by Columbia River Knife and Tool (CRKT) was presented to the SHOT SHOW in Las Vegas in 2014 as a production prototype. This knife bears the signature of Lucas Burnley, a knife maker specializing in the production of tactical knives. The influence of traditional Japanese shapes is very strong, both in the typical forms of kwaiken and also in the choice of the name: Obake, in fact, is a Japanese word お化け that can be translated into "shadow, specter, apparition, spirit, ghost or simulacrum" but more generally it refers to the transformation of a living being into a spirit or supernatural being. The traditional kwaiken is to all effects a small Tanto knife with overall length of 20-25 cm, devoid of tsuba (the guard) and habaki (the metal collar placed on ricasso making the seal in saya - the sheath), with a slightly curved blade with one or two wires, traditionally very sharp, with the tsuka (handle) and saya (sheath) of simple lacquered wood and horn or silver decorations. This type of blade was generally hidden between kimono folds by the women of the Military Families (Buke and Bumon), and generally it was used for self-defense and, in particular circumstances, to commit seppuku, ritual suicide as atonement for a wrong committed or as a means to escape from a dishonorable death. In this modern version of kwaiken, produced by CRKT, the knife has a full-tang blade with an overall length of less than 20 cm and a traditional Tanto blade 9 cm long and 3 mm thick. This is made in 8Cr14MoV steel with hardness of 58-59 HRc, and it has a finished surface obtained by acid etching and a coating of gray color of titanium nitride; this kind of finishing is performed individually on each blade knife so that each one will have a unique texture. The handle, under the cord-wrapping (traditionally called tsukaito), was made of plastic with a 3D conformation that replicates exactly the samé, the rayskin typically used in Japanese swords and knives; this fake samè is replicated really well, with a shiny effect that gives at first appearance the feeling of material authenticity. 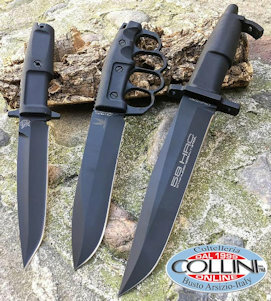 The black cord wrapping is resin-impregnated to increase durability and to improve grip on the knife. The Obake is equipped with a glass filled black nylon sheath, perfectly shaped on the blade, to which is applied a black paracord lanyard with a skull bead; this latter aesthetic solution, while not meeting my personal taste, appears to be the current fashion. The sheath comes with a plastic belt loop which is not particularly rigid and can be mounted by means of two screws and rubber o-rings. The product appearance, the reduced size and weight, makes the Obake an ideal knife for easy concealment. From the point of view of use as a weapon , this tool has several advantages compared to a folding knife: with a fixed blade knife it is, in fact, possible to perform a quick extraction wasting no time in opening the blade, and there are no problems with the safety engaged or not (as in an automatic opening system, and sometimes in those with assisted openings, which allow the quick opening of a blade in one step). It is also possible to reduce to a minimum the movement required for the implementation of a technique , extracting and cutting with a single fluid movement of the arm. All these practical features have been smartly addressed in the Obake, as it does not have the appearance of a proper tactical knife. The blade and the handle have the dimensions that ensure it is strong in the event of extreme use but, at the same time, the thickness of the handle and sheath allow concealment in one crease of the dress. Clearly these opportunities are related to product analysis and we do not want to encourage our readers in any way to employ these actions, since from a legal point of view the act of self-defense is not a justifiable reason to carry a knife (in Italy, as in most European Countries). The tests carried out with the knife have revealed a good sharpening of the Obake; it is a knife indicated by the manufacturer as an EDC fixed blade, so tests were performed on materials that you may encounter on a daily basis, such as paper and cardboard, but also on materials such as paracord and mooring ropes of various diameters (from a 1cm in diameter, and a 3-strand twisted rope of 1.6 cm). On these latter, like on all other materials, the cutting is done in seconds without any effort and in a very clean way. Overall, the Obake is a very light knife, so making it an EDC knife which is very comfortable to wear (in countries where it is legally permissible). In addition, the blade finish makes this knife interesting from the aesthetic and collectible point of view.